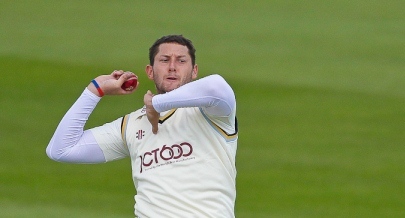 Bresnan’s a bull, maybe even a bison. Something bovine, definitely not feline. I’d be interested to know whether KC and others in The Kingdom feel that this particular incident warrants being a gate. Let’s go with disappointed and hungry. It makes us feel tired, slightly sweaty and resentful of having to be indoors. What is more more extraordinary is that he appears to have been 24 in 2007 and eight years on he is barely 30. From the following clip I can see why KC thinks he looks like a burly puma. There’s a case for saying we added the 2007 fact after we’d already written a paragraph about him being 24 back when he could bat. However, those who know us well will know that this is actually a fairly typical case of embarrassingly poor addition. We’ll try and make a correction but will doubtless get even that wrong. In some test playing nations (well, at least one) a temporal discrepancy of two years is a mere bagatelle. Where’s your sense of creative accounting, KC? This is slightly off the subject but has it been explained why the ECB has loaned 18.1 billion euros to Greece? Whilst Ged is here please explain to me why this little story doesn’t work. A rich businessman arrives with his staff at a hotel on a poor Greek island. Everyone on the island has debts they cannot meet. He explains to the hotel owner that he will be staying for a few days to assess the island as a tourist resort and he puts $5000 on the counter as a deposit. As soon as he leaves the hotel owner goes to his supplier and pays him the $5000 he owes him, the supplier then goes to the farmer and pays him the $5000 he owes. The farmer goes to the local prostitute and pays her the $5000 he owes. She arrives at the hotel and pays the hotel owner the $5000 for use of his rooms. A bit later the businessman comes back, says he doesn’t like the island, gets his deposit back and leaves. Now no-one has any debts! Good question (I may be slightly mad to answer this question on a cricket blog, albeit a terrific one – but in the spirit of cats looking disinterested here goes)- each if the parties in this instance (except the tourist) have net nil debts – ie. equal assets and liabilities. The prostitute/hotel/farmer have a net debt of zero – but there are issues because none of the parties have actual monetary consideration to pay off debts . The introduction of the tourist in this game allows for an easy solution. In real life, Giles Clarke has loaned Greece 18.1bn when it has no/scant assets (zither than it’s crumbling palaces). Frankly the hotel is barking mad to have let it get to this stage. Could’ve easily sold its loan payable (from the pros) to the farmer in exchange of the loan receivable owing from supplier to farmer. Then could’ve netted off the supplier receivable and payable. QED no need for cash and for tourist. Simples. I’m sure the icc champions trophy ranking formula is that elegant. It doesn’t work because the farmer incurs further debt when he visits the prostitute. The little story does work, Rus. The islanders had a liquidity problem, not an insolvency problem. The businessman’s injection of cash (the deposit which he later withdraws) provides short term liquidity, which the islanders used to settle their debts with each other. Amongst themselves, the islanders didn’t really have a problem before the businessman arrived. As he withdrew his deposit rather than spending actual external cash on the island, after the businessman leaves the island remains as poor as it was before. But the islanders might now feel better because they have repaid their theoretical debts with each other. I liked the Bresnan headline btw were we all supposed to say “No”? My friends and I failed to recognise him warming up before a Trent Bridge test a few years back, because he was unaccountably not as fat as we had assumed. Later, Stuart Broad took a hat-trick,and England won. How is that a coincidence, eh? I still don’t get that joke. And I stared at it a long time too. A very long time. Let’s put this to bed. It was a reference to Betteridge’s law of headlines which we’d referred the previous day. Oh thank God. Or, thank KC, I suppose. Thanks for that Montgomery. I’ll wait to see if Ged can weave any sardines into the equation. I was never happy about the explanation that the ones in tins/cans didn’t taste very good. The idea behind the “trading sardines” story is that the increasingly rare tins of sardines in the early 1900’s became tokens for speculative trading rather than an actual commodity being traded for a purpose. So when a trader decided to actually try one of the tins of sardines he had bought, they tasted awful because they had been traded well past their shelf life. …he says, trying to get the subject away from The Price of Fish (now also available in paperback) and back onto cricket. I would like to say thank you to Fred Grace, he was the one who made KC understand it. Harris is injured. In other news, bear spotted squatting in nearby forest.